A new American study suggests that eye doctors could use donor corneas stored for up to eleven days in transplant surgeries. This goes against the current medical practice of only using donor corneal tissues that have been stored for less than a week. Researchers examined 1,090 patients who underwent Descemet stripping automated endothelial keratoplasty (DSAEK) procedures. Every patient involved in this study received donor corneal tissues that were stored between eight to fourteen days. Over the course of three years, researchers kept tabs on study participants' corneal graft success rates. They found that there was no major difference in overall eye health between people who received corneas stored for seven days or eleven days. The average success rate for people with donated corneas stored for eleven days or less was 90 percent. This study has huge implications for the future of corneal transplant surgery around the world. Since eye doctors now know they can store donated corneas for longer periods of time, this dramatically increases the amount of corneal transplants they can perform. Dr. Jonathan Lass, an ophthalmologist at Case Western Reserve University, was the lead author on this study. He told reporters that this study "will help to meet the expected future demand for corneas in this country as well as in patients overseas." For those who don't know, DSAEK is a corneal transplant surgery that removes a part of the eye called the Descemet membrane and the endothelium. The surgeon then inserts a donor corneal endothelium and stroma. A few of the conditions DSAEK treats include Fuchs' corneal dystrophy and iridocorneal endothelial (ICE) syndrome. 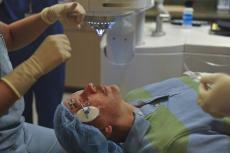 About 30 percent of all the donated corneas in American eye banks are used in surgical procedures outside the USA. While reviewing this latest study, executives UK's NHS Blood and Transplant said they stored their donated corneas for at least 28 days. However, the donated corneas in the UK are stored at a different temperature to those in the USA. More research is needed to see which storage temperature is more effective. The World Health Organization (WHO) estimates that 10 million people with severe visual impairment could be treated with a corneal transplant. Unfortunately, most eye banks don't have enough donated corneas to meet that demand. Developing nations in Africa, Latin America, and Asia are in dire need of donated corneas. India alone has the largest population of blind individuals and must perform 100,000 cornea transplants annually to get a grip on the situation. As of today, Indian doctors can only perform 25,000 successful cornea transplants per year. There is hope that artificially produced corneas could supply developing nations with the tools they need to meet these major health issues. Scientists are currently working on bioengineered corneas, but this technology is still in its infancy. Anyone can read more about this study in a recent edition of the medical journal JAMA Ophthalmology. This study is entitled, "Corneal Endothelial Cell Loss 3 Years After Successful Descemet Stripping Automated Endothelial Keratoplasty in the Cornea Preservation Time Study A Randomized Clinical Trial."